“I should probably stick my hand in there to see if there are any deposits,” Candy jokes. Something from the tooth fairy, maybe? I have to say, the Cummins dental office marks one of the rare occasions when I have gotten a column out of somebody’s office. 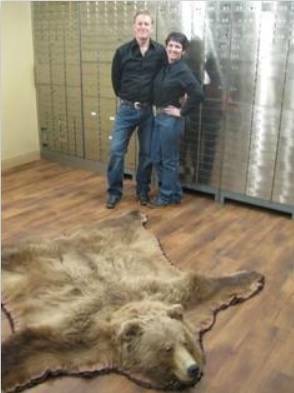 Maybe it’s the stuffed buffalo head in the main reception area or the still-functional bank vault. Or it could be the three canoes hanging from the ceiling or the stuffed brown bear in the basement. This office is a mix of Texas (Candy), Alaska (Keith) and fiduciary responsibility. That’s why Keith’s office is called Magna Dental, simply because the building used to be a Magna Bank. And you know how we are. Even years after a business has closed, we still refer to it as their building. The Cumminses had outgrown their old office at 613 N. Seventh St. and really, really wanted to find an existing building they could repurpose. The bank building was there, funky blue roof and all, but Candy wasn’t seeing how it could work as a dental office. Not until she woke up at 5 a.m. one day and it was all there in her head. “It looked like everyone who was working at the bank had just gone to lunch and never came back,” Keith says. They think people keep coming by to transact bank business because at the end it was a Regions Bank and still says so on a web page. Keith loves geology (that’s why someone gave him the petrified mastodon teeth in his office). He is a federally licensed firearms dealer (so one bank safe will be used to store guns securely). And he is a licensed Alaskan hunting guide (which explains the stuffed big game in the office). See, it all makes a sort of weird sense. Candy rides horses; Keith hunts. It’s all there in the office, from the little girl’s cowgirl outfit and western movie posters to the buffalo that Keith shot at Ted Turner’s ranch in Nebraska.